Timur Kibirov is a poet. He was born in 1955. He graduated from the Philology and History department of the Moscow Regional Pedagogical Institute. He began to gain acclaim as an underground poet in late 1980s, although his work—with its frequently ironic portrayals of the absurdities of Soviet life, its nastiness and comedy, its tender and unbearable routines—could not be published during Soviet times. 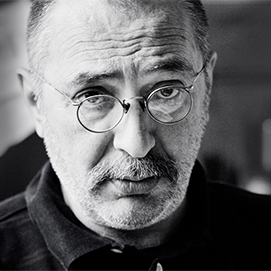 Since the early 1990s however he has published and read widely, becoming one of contemporary Russia's most recognized poets. Kibirov is the author of thirteen poetry collections, including When Lenin Was Young (1995), Amour, exil (2000), and In the Margins of “A Shropshire Lad” (2007), his remarkably free translation of A. E. Housman’s classic work. Kibirov has won many honors, including the “Anti-Booker” award (1997) and Russia’s prestigious “Poet” prize (2008) and Znamya magazine award (2010). English translations of his poems have appeared in The Poetry of Perestroika (Mortimer & Litherland, 1991), Third Wave: The New Russian Poetry (Johnson & Ashby, 1992) and Contemporary Russian Poetry: An Anthology (Kates & Bunimovich, 2008). He lives and works in Moscow.